"Kathrina" is the first necklace in my high-end collection featuring vermeil, amazonite, and a mother of pearl stone encased in a 22 karat gold plated brass pendant. This one-of-a-kind necklace is both classic and bohemian as its design combines an elegant shade of aquamarine blue with matte gold components with organic textures. The name Kathrina, a variant of the Greek name Katherine, means "pure," which I feel is apropos. Each faceted amazonite stone is a natural pastel shade of aqua blue and is separated by a piece of faceted vermeil. There are over thirty pieces of vermeil, 22 karat gold plated sterling silver, in this exquisite necklace. The focal piece of this necklace is a mother of pearl stone in a beautiful 22 karat matte gold plated brass pendant. Three matte gold plated brass drops add interest and movement to the centerpiece. The mother of pearl is a lovely opalescent white and looks stunning set against the matte gold frame. The pendant is 2 1/8" wide and 2" long from top of bail to end of drops. Two organically textured 22 karat gold plated brass tubes echo and compliment the textured bail of the mother of pearl pendant. Near the ends of the necklace are two 22 karat matte gold plated brass cones with floral scalloping and a lightly textured motif. Tiny white shell beads terminate each side of the necklace and add balance to the design. The necklace ranges from 20 5/8" to 22 1/2" long. At 22", or matinee length, it is versatile for office, evening, and casual wear. And, worn at it's shortest length, it would look lovely with a v-neck or sweetheart neckline wedding gown. Kathrina closes with a vintage-style lobster clasp (see the first three images of this post for details). 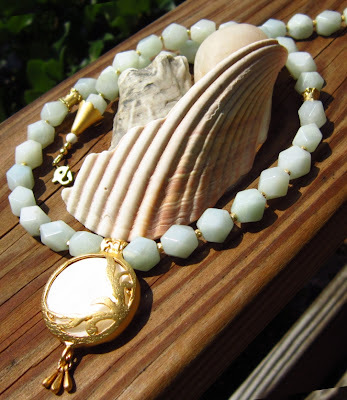 For those interested in the necklace's metaphysical properties, the combination of mother of pearl, amazonite, and gold make this necklace perfect for increasing intuition and creativity. In addition to the latter properties, Amazonite is associated with the throat chakra, which helps communication and understanding. Mother of Pearl, also known for its ability to increase one's intuition and psychic abilities, is associated with the heart chakra. Because this necklace has a high gold content, it is important to note that gold holds and therefore increases the energies of the other stones in the necklace (source here) . You can buy this necklace here at my Etsy shop !